Boomerangs: Can you bet on ex-employees? The world of work is constantly changing, and one of the latest developments is the attitude towards those employees affectionately known as ‘boomerangers’! In the past HR have shown reluctance to bringing ex-employees back into the company, and it’s understandable to see why. It may seem that the employee has minimal commitment to your organization, but that is far from the whole story. 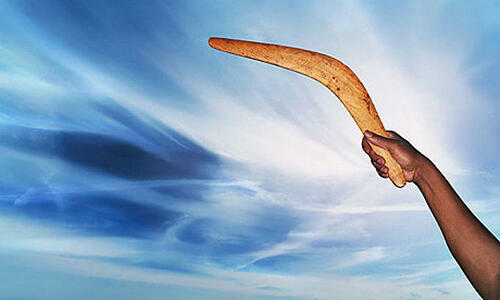 The trend is reversing and now HR is seeing the benefits of boomerang employees. When employees leave and then want to return to your organization, it speaks volumes about the positive nature of your company culture. Ex-employees have experienced the reality of where they thought the grass would be greener, and they have decided your organization offers an environment so great that they want to return! 2. You benefit from fresh insight. When people move to a new organization, they learn how others look after their employees, treat their customers and operate their business. As the organization which rehires them, you can benefit from them bringing new skills, best practice and fresh ideas back to you. Boomerang employees are great brand ambassadors. If they are so keen to return, how many other people have they told about how great it is to work for your company? So, old employees have experienced what it is like to work elsewhere, and they have then decided your organization is the best of the bunch. Consequently, your current employees begin to see you in a new light! They now see your company as more desirable than any other, and if they had an inkling that there may be better opportunities elsewhere, returning employees could reduce their curiosity. Creating a culture of boomerangers encourages HR to take a good look at the factors that encourage people to leave the company. The fact that they want to return already means you’re doing many things right, but if you could make your organization even more desirable to top talent wouldn’t you want to go the whole way? Understand why people left – Once you understand why they left, you can work to improve the factors that made them leave. It could be a lack of development opportunities, poor pay, or minimal recognition for good work. Improving these factors is a good way to prevent other top talent from leaving too. Keep in touch with great employees that leave – If you keep the relationship going as a starting point of a rehire policy, people will know the door is always open for them. Encourage great people to fly! - Inspire great people to go on sabbaticals, learn new skills, and experience new cultures, but encourage them to bring those experiences back to the nest. It may seem daunting to encourage people to spread their wings, but if you create the best culture possible why wouldn’t people want to return? Organizations are beginning to get on board and seeing the numerous plus points to creating a boomerang culture and bringing valuable employees back to the nest. With so many benefits for having boomerang employees, who are we to stop them from flying high?